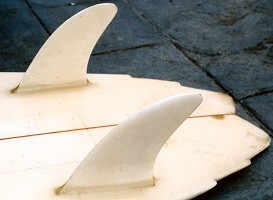 1979 Mark Richards Twin fin II 5 ft 4"
Tail: swallow tail, double flyers, image below. 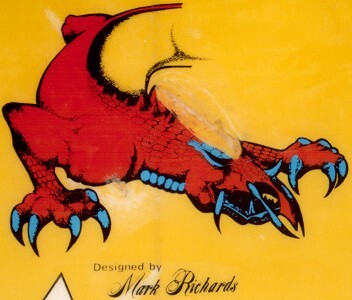 1.Lizard - red graphic,Designed by Mark Richards' black text. Sweet spot. Image right. 2. 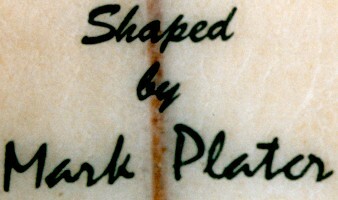 'Shaped by Mark Platter' black script, tail. 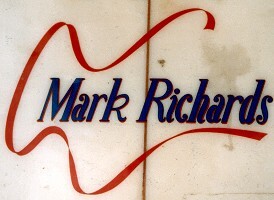 'Mark Richards' script and ribbon graphic, dark blue/red. Sweet spot. Image below. Deck: MP , pencil at rear sweet spot. Blue rail spray with detail to flyers, image below. 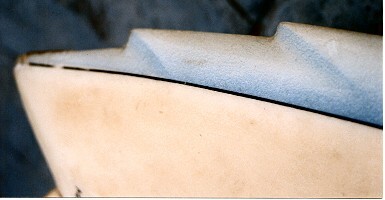 Extensive dings to nose (repaired and sprayed), deck (to decal), bottom and tail. 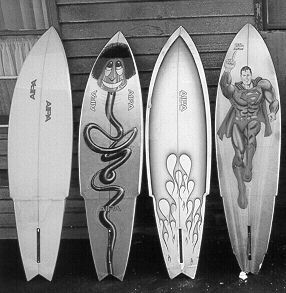 Silhouette of stickers removed from bvottom. Repairs to swallow/flyer tips and leg rope damage. 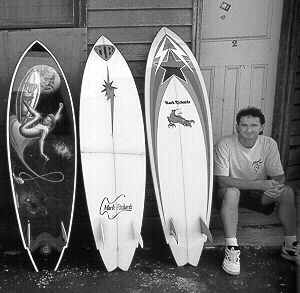 Photographs and dimensions, 24 May 2004. 3/1 Noble Street Gerringong NSW 2534. Phone 02 4234 0208. Thanks to Scott and Angela Anderson.